Smart and simplistic fashion, this men's Guess watch boasts a sleek stainless steel bracelet and case, and a crisp white dial featuring black slim line indexes and two hands. Everyday-wear for the sophisticated and stylish man. 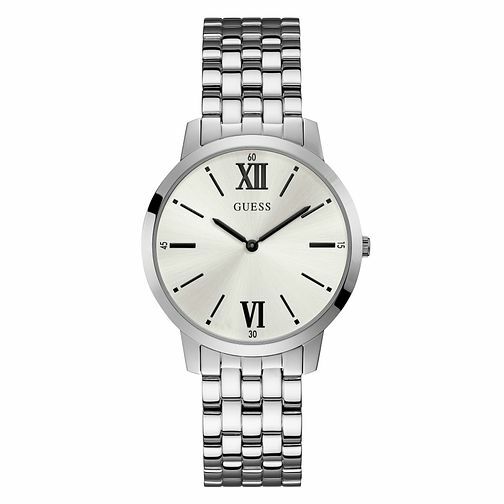 Guess Men's Stainless Steel Bracelet Watch is rated 5.0 out of 5 by 1. Rated 5 out of 5 by Anonymous from Excellent watch The watch is well made and looks great! The weight feels great on your wrist. Many compliments from the watch!